Even the feet (after parboiled and peeled) are golden when it comes to stock (well, maybe not quail). 6/1 water to mirepoix by volume, e.g 6 quarts water, 1 quart (4 cups) mirepoix. 8 lbs Poultry parts — lots of bones, but try to include at least 20% meat by weight. Crack or cut bones. 6 chicken feet — optional (improves body). Blanch/skin them if they didn't come that way. 2 cup yellow onions — Diced. Toss in papery skin also. Can substitute leeks. 1 cup celery — Diced. Leaves OK.
6 quarts cold water — at least enough to cover everything. 2 cups dry white wine — e.g. Pinot Grigio, Sauvignon Blanc, or Chardonnay. Cheap is fine. Reserving half the mirepoix, toss bones and mirepoix in oil, then season lightly with salt and pepper. Place on rack in large roasting pan, or separate meat/bones and vegetables into 2 smaller pans. Roast until golden brown, 30 to 40 minutes. Turn the bones about halfway through. Transfer roasted bones and vegetables to a large stockpot, add the remaining ingredients (except parsley leaves and reserved mirepoix). Deglaze the pan with wine, pour into stockpot. Add cold water to cover everything then bring to a simmer. You can use high heat to get it there, but watch carefully and do not let it come to a full boil. And no stirring — ever! Once simmering reduce heat and slow simmer 4-24 hours (some suggest as short as 90 minutes. Uncovered if you have more water than you need (watch it and add boiling water as needed to keep the goodies submerged), or covered if you prefer. Some think > 4 hours is a bit fanatical, they could be right. The point is to extract all of the available collagen and flavor, but there is a point of diminishing returns. If leaving unattended overnight, especially over a gas range, for safety you should use the oven-finish (details below). Early in the simmering process, unappetizing looking stuff sometimes floats to the top. Most recipes encourage you to skim it off, but some say don't bother. I never bother and it doesn't seem to hurt anything. Optional oven finish: carefully move the covered stockpot to a 190°F oven after brought to a simmer. This saves the hassle of adjusting a burner for a consistent slow simmer and frees up the stove. Check the stock temp hourly and adjust your oven if needed until you are confident the stock is settled in somewhere around 190°F. Many ovens have an automatic 12-hour shutoff, so you should turn it off then back on before you go to bed if letting it go overnight. And then again when you get up, and again mid-day if you're going for a long cook. Another alternative is to use a slow cooker or an electric roaster. These can even be used in a garage, or covered area of a deck or porch, if you're cooking in AC weather and prefer not to heat up the house. If cooking in furnace weather do it inside! It smells great. Half an hour before finish, add the reserved mirepoix. Get it submerged by poking it down or gently mixing near the surface, but don't aggressively mix. 10 minutes before finish, add parsley tops whole, don't chop. Same routine on mixing. Remove from heat. The next steps until placed in the refrigerator should be taken without delay. Remove large items to a colander over a bowl to catch drippings. Filter out remaining solids using cheesecloth, muslin, old clean t-shirts, a chinois, etc., whatever you have handy. Ladle through the filter into another pot. How well you filter it is a matter of taste but be sure to get out any bone bits. Press or squeeze out and save all the liquid you can before discarding the solids. Optional: Salt to taste. Go easy, because most recipes expect the stock to be unsalted. Never add salt if you plan to reduce the stock. One advantage of salt is that it buys a little more shelf life in the fridge. Chill the pot quickly to at least room temp, then move to the refrigerator to chill overnight. The initial fast chill can be done by setting the pot in an ice bath in the sink. Stirring the pot, and keeping the cold water bath moving speeds things up. After cooled to at least room temp, move to the refrigerator. The next day remove any fat solidified on top. Discard it, or mix it with seeds for bird feeder suet. Evaluate your stock for body — watch the video at the top to see how it should look. Optional: If not as gelatinous as you want, warm up the stock. Per quart add 1 packet of unflavored gelatin first softened in 1/4 cup cold water. Optional: Clarify. Google “egg raft” for instructions. Leaves a crystal clear liquid — necessary for consommé, aspic or any soup which should be very clear. Another benefit is you have to deal with the yolks. Om nom nom nom. Good up to 4 days in the fridge. Freezes forever. 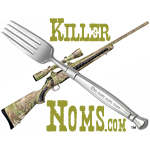 See KillerNoms.com/WildGameStock.php#storage for details on storage.